A team of European astronomers is using the NASA/ESA Hubble Space Telescope to look back in time. They have imaged the spiral galaxy NGC 3982 and hundreds of other galaxies in the hope that one of the millions of stars in these images will some day explode as a supernova. They can then look back and pinpoint the exact star that has exploded. Only two such supernova 'mother stars' have ever been identified. 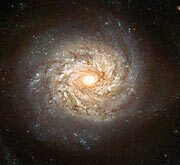 The fantastic resolution of the Hubble Space Telescope allows individual massive stars in other galaxies to be detected. A team from Cambridge and Trieste have used Hubble and ESO's Very Large Telescope to image NGC 3982 and several hundred other nearby galaxies in the hope that a few of the stars in these images will explode as supernovae in the future. When a star of more than 10 times the mass of our Sun reaches the end of its nuclear fuel reserve, it can no longer produce enough energy to keep it from collapsing under its own immense weight. The core of the star collapses, and the outer layers are ejected in a fast-moving shock wave. These supernova explosions are at the heart of our understanding of the evolution of galaxies and the formation of the chemical elements in the Universe. Yet astronomers have been able to identify only two stars that later exploded as supernovae with any confidence. Supernovae have many different characteristics and understanding exactly which type of star produces which kind of supernova is a fundamental challenge. To find these supernova 'mother stars', the team has undertaken this intensive study of the nearby Universe and is now playing a waiting game. It appears that typical spiral galaxies produce one supernova roughly every 100 years and so the team has to study a large number of galaxies to stand a chance of being lucky enough to catch a star before it destroys itself and becomes either a neutron star or a black hole. By using the most powerful telescopes both in space and on the ground to take images at different optical and infrared wavelengths, the temperature, luminosity, radius and mass of the stars that later explode can be estimated. This will allow astronomers to see exactly which types of stars produce supernovae and to test if their theories for the origins of these cosmic explosions are correct. The beautiful galaxy NGC 3982 is a typical spiral galaxy and looks just as our own galaxy, the Milky Way, would if we could view it face on. It harbours a huge black hole at its core and has massive regions of star formation in the bright blue knots in the spiral arms. Supernovae are most likely to be found within these energetic regions. This colour image is composed of three different exposures with Hubble's Wide Field and Planetary Camera 2 through a wide blue filter (450 seconds), a wide green filter (55000 seconds) and a wide red filter (25000 seconds). The team is composed of Stephen J. Smartt, Justyn R. Maund, Gerry F. Gilmore (all University of Cambridge) and John Danziger (Trieste Observatory). The composite image was constructed with data from the ESO/ST-ECF Science Archive. Additional Hubble exposures were obtained by A. Saha (National Optical Astronomy Observatories), L. Labhardt (Universität Basel), F. Macchetto, N. Panagia (both Space Telescope Science Institute) A. Sandage (Carnegie Institution of Washington) and G. Tammann (Universität Basel).